On July 9th 2012, 110 district election commissions were formed, each consisting of 13 people. 1,430 people out of 2,127 nominees were selected as commission members. Out of 199 people nominated by the political parties in opposition, 48 were included in the commissions (24%). By contrast, the pro-government organisation “Belaya Rus” nominated 117 citizens, 106 (90.5%) of whom became commission members. The district election commissions were mostly formed of members of pro-government organisations: The Federation of Trade Unions of Belarus, BRSM (Belarusian National Youth Union), “Belaya Rus”, and the Belarusian Association of Veterans. The commissions were formed under control of the executive without public discussion of the nominees. The absence of any formal criteria made it possible to manipulate the procedure of forming the commissions to the benefit of the organisations loyal to the authorities. Representatives of the opposition groups make up an insignificant – disproportionally small – share in the commissions, compared with the number of nominees put forward. 1. The district election commissions play an important role within the election process. In particular, they have the authority to organise the election, manage the activity of precinct election commissions, register initiative groups of citizens for the collection of signatures in support of candidates’ nominations, register candidates and their proxies, check the lists of voters and consider statements and complaints about the decisions made by precinct election commissions. 2. Election legislation fails to ensure the transparency of the process of forming the district election commissions. The absence of any legally objective criteria for selecting citizens for election commissions gives the bodies responsible for the decision an absolute right to determine the commission membership. Civil society structures are unable to influence the activity of these bodies. 3. Some positive changes in the election law, in particular the restriction of participation of state officials in the activity of district election commissions, are cancelled out by the absence of a control mechanism governing their implementation. The absence of criteria for selecting members of election commissions makes it ineffective to complain in courts about non-inclusion in the commissions. 4. Information about the place and time of the meetings of the bodies that form the district election commissions was only partially made public. 5. In the overwhelming majority of cases, decisions on the membership of district election commissions were taken by voting for complete lists, without open discussion of the nominated candidates. The Initiative “Human Rights Defenders for Free Elections” observed interference by executive organs in the process of nominating representatives to the district election commissions. 6. 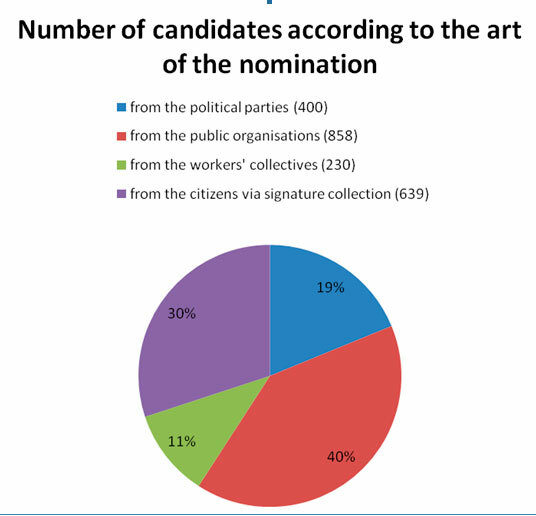 Despite increased activity of the opposition political parties in the nomination process compared to the parliamentary elections in 2008, only 24% of their nominated representatives were included in the commissions. According to Article 28 of the Election Code, the preparation and running of the election to the House of Representatives is handled by district and precinct election commissions. According to Article 34 of the Election Code, commissions for the House of Representatives elections are formed by presidiums of the regional and Minsk city Councils of Deputies and regional and Minsk city executive committees. Members include representatives of political parties, other non-governmental associations and workers’ collectives, as well as representatives of citizens who are nominated by citizens’ application. District commissions consist of 9-13 members and are formed no later than 75 days before the election. The nomination procedure is regulated by Article 35 of the Election Code and Ruling of the Central Election Commission #22 of June 19, 2012. The following entities are entitled to nominate one representative to district election commissions: governing bodies of political parties and other non-governmental associations (to all district commissions); convention of an organisation’s workers’ collective or the collective of a structural unit of an organisation located in a rayon or town (to district commissions that are created on the territory of a rayon or town respectively); collectives in cities with multiple rayons (to district election commissions created on the territory of the corresponding rayon in a city); voters in a group of no less than 10 citizens who live on the territory of the corresponding district and have signed the statement about nomination of representatives (to the district commission). According to Article 34 part 6 of the Election Code, no less than a third of commission members should be represented by members of political parties and other public associations. Judges, prosecutors, heads of local executive and administrative bodies cannot be members of election commissions. Civil servants should not make up more than a third of any commission. Representatives of political parties, other non-governmental associations, workers’ collectives and citizens who have nominated their representatives to election commissions have the right to be present at the meetings of the bodies that form the commissions. Entities that have nominated their representatives to commissions can appeal to the regional and Minsk city courts against the decisions of the bodies that create the commissions within three days of the decision being made. The courts have three days to consider the appeal and make a final decision. 4) The amended version (Article 34) entitles entities that have nominated representatives to district commissions to be present at the meetings of the bodies that create them. 5) Article 34 of the Election Code entitles the entities that have nominated representatives to commissions to appeal to court against decisions of the bodies that create the commissions. The practice of court appeals during the local and presidential election in 2010 showed that the absence of precise legislative criteria for the selection of commission representatives makes this procedure an ineffective means of restoring the balance in the commissions. When considering such appeals, the courts ignore the appellants’ arguments regarding the discriminatory approach. According to the election schedule, approved by CEC Ruling #17 of June 19th, 2012, nomination of representatives to district election commissions and submission of the appropriate documentation to the bodies creating the commissions should take place no later than July 6th, 2012. 2,127 people were nominated to the district election commissions. Among them, 639 (25%) persons were nominated by groups of citizens, 230 (9%) by workers’ collectives, 858 (40%) by non-governmental organisations and associations, and 400 (19%) by political parties. The political parties in opposition were quite active in their nomination of representatives to district election commissions. The Belarusian Party of the Left “A Just World” nominated 88 persons, the BPF Party – 57 persons, UCP – 34, BSDP (H) – 6, the Belarusian Party of the Greens – 5, and Belarusian Social Democratic Hramada – 9. This means that altogether the Belarusian opposition parties nominated 199 persons, i.e. 9.35% of the total number of people nominated to the district election commissions or 49.75% of the people nominated by political parties. For comparison: during the 2008 parliamentary elections the opposition political parties nominated 118 persons, making up 31.9% of contenders nominated by all political parties. Just as during the previous election, pro-government public associations were active in nominating their representatives to the commissions: The Federation of Trade Unions of Belarus – 279 persons (13.1%), the Belarusian Public Association of Veterans – 98 persons (4.6%), BRSM – 108 persons (5.1%), the public association “Belaya Rus” – 117 persons (5.5%). These four public associations were responsible for 28.3% of all nominations and 70% of those nominated by public associations. Some political parties and movements, which support the idea of boycotting the election, did not nominate representatives to district election commissions: The Conservative Christian Party of BPF and an unregistered party of Belarusian Christian Democracy. The public association “The Movement for Freedom” did also not nominate any representatives. The “Tell the Truth” campaign nominated only 8 persons. Meanwhile, neither “The Movement for Freedom” nor “Tell the Truth” announced their support to the idea of boycotting the election. On average, 1.5 persons competed for each place in a district commission. In the Minsk and Homel regions the competition was 2 persons per place. 110 election districts were formed. By region: 20 commissions in Minsk, 17 commissions in the Minsk region, 17 in the Homel region, 16 in the Brest region, 14 in the Vitebsk region, 13 in the Mahiliou region and 13 in the Hrodna region. According to the election schedule, meetings of presidiums of the regional and Minsk city Councils, and the regional and Minsk city executive committees, took place on July 9th, 2012 within a prescribed period. State-owned media and internet pages of the regional and Minsk city executive committee did not publish information about the time and place of the meetings. Representatives of the entities that had nominated their members to district election commissions learned about the place and time of the meeting from representatives of the executive bodies. The meeting of the presidium of Mahiliou regional Council of Deputies and the regional executive committee lasted for more than one hour. At the same time, there was no discussion about the nominees, voting for membership of each commission was done according to earlier prepared lists. When asked about the reasons for non-inclusion of certain nominees, the representatives of the bodies creating the commissions responded in a vague manner. In the Brest region, nominees for the commission had no chance to introduce themselves. Their candidacies were not discussed. General selection criteria were announced during the meetings: experience of work, responsibility, size of a political party or public association. Draft decisions were prepared for voting. Kanstantsin Sumar, head of the Brest regional executive committee, proposed the inclusion of 6 representatives of political parties instead of representatives of other entities. The proposal was supported. In the Homel region, the meeting of the presidium of the regional Council of Deputies and the regional executive committee lasted for 13 minutes. The meeting participants voted for the lists which had been prepared earlier by the working group. In the Minsk region and in Minsk city there was no discussion about the nominees; meeting participants voted for the lists which had been prepared earlier. Observers point out the biased and subjective nature of the decisions. For instance, representatives of the political parties in opposition were turned down on age grounds, whilst members of veterans’ organisations were included in the commissions. Among other grounds for refusal were a lack of previous work experience in election commissions, the lack of an official job, the authority of a nominee in the region and doubts whether nominees would be able to participate in the commission’s work. Information about the place of work and positions of the persons approved as members of the commissions was not disclosed during the meetings, despite the appropriate requests being made. According to the Central Election Commission, district commissions have been formed with the maximum number of members – 13 persons in each commission. 1,430 people became members of election commissions. The political parties in opposition are represented by 48 persons (3.3% of all district election commission members and 24% of those nominated by opposition political parties). 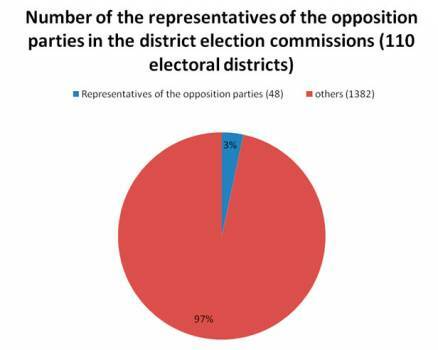 By comparison, during the previous parliamentary elections the opposition parties nominated 118 representatives to district election commissions, 38 of whom were appointed (2.2% of the total number of district commission members and 32% of those nominated by opposition parties). Therefore, this year the political parties in opposition nominated more representatives to district commissions than in 2008. However, proportionally, fewer of their representatives became commission members than in 2008. During the parliamentary elections in 2004 the opposition parties nominated 318 persons to district commissions, 20 of whom became commission members (7% of those nominated and 2% of the total number of commission members). Just as during the previous elections, the main organisations represented on district election commissions are the Federation of Trade Unions of Belarus, the Belarusian National Union of Youth (BRSM), the public association “Belaya Rus”, and the Belarusian Public Association of Veterans. “Belaya Rus” has 106 representatives as members of election commissions (7.4% of the total number of commission members). This way, despite the fact that the number of political party representatives in district commissions has somewhat increased compared with the 2008 parliamentary elections, the number of rejections has remained at a very high level. The Initiative “Human Rights Defenders for Free Elections” points out that in 2008 the opposition political parties deliberately limited their representation in election commissions, proposing just one representative per commission from all opposition parties combined. This time, there was no agreement of that kind, i.e. sometimes the political parties in opposition nominated their representatives to the same commissions. At the same time, the “pass” rate of pro-governmental representatives was significantly higher this year. This is evidence of the biased attitude towards the opposition parties’ nominees. For example, the “pass” rate of “Belaya Rus” representatives stood at 90.5%. According to Article 34 part 6 of the Election Code, entities that have nominated their representatives to election commissions can appeal to the appropriate regional or Minsk city court against the decisions taken by the bodies that create the commissions within three days of the decision being made.. The appeal is to be signed by the head of a political party, a public association, an organisation (or its structural unit) or by citizens who have nominated representatives to election commissions by signature collection. A court is to consider the appeal in three days and make a final decision on the case. As this report is being prepared, the opposition parties are preparing their appeals to the regional and Minsk city courts. According to Article 34 part 5 of the Election Code, the meetings of bodies that create the commissions are open for representatives of political parties, other public associations, workers’ collectives and citizens who have nominated people to the commissions. The Election Code does not foresee the presence of election observers during these meetings. The observers point out, despite the fact that the Election Code does not place a direct ban on participation of more than one representative of an entity that has nominated a representative, it has become common practice to limit the number of such representatives to one person from each entity. The executive bodies decide on their own who is to be present during the meeting of the body that creates the commissions. That is why Anatol Rodzik, member of the party “A Just World”, was not allowed to be present at the meeting of Vitebsk Council of Deputies and Vitebsk regional executive committee, as they had invited another representative of this party. Information about the time and place of meetings was given directly to the persons who had filed the nomination papers. The persons present during the meeting of the decision-making body could ask questions about the grounds for a certain decision. However, the selection process was carried out without public coverage or discussion. The representatives present during the meetings did not have an opportunity to get acquainted with the nomination materials (minutes of the meetings, nomination applications, etc. ).